Suffolk House Antiques | A Charles I oak mural salt cupboard. A CHARLES I OAK MURAL SALT CUPBOARD. A Charles I oak mural salt cupboard of heavy panelled construction with channel moulded door decorated with scratchwork designs of circular geometric form. The interior shelf, pin hinges and hanging rings are original and with panelled sides and back. Excellent untouched colour. 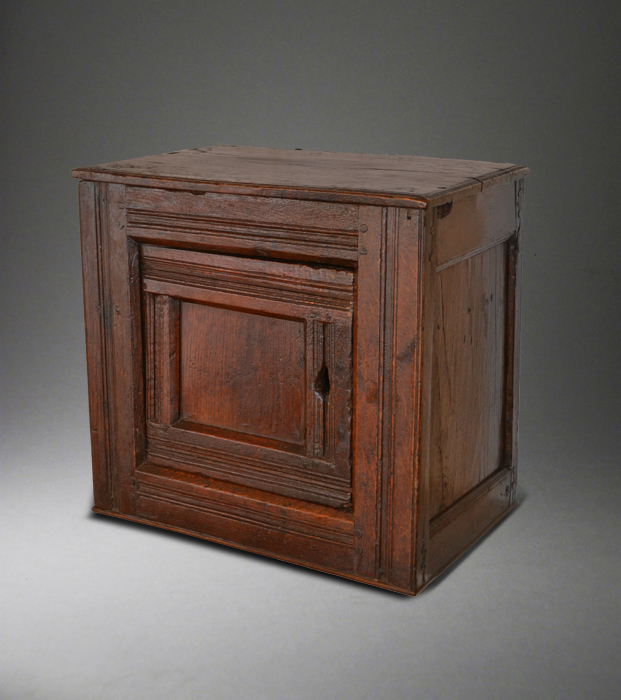 Such cupboards, often from Westmorland were made to keep salt or spices both dry and secure and were often placed near to the fireplace. 19 inches wide x 12 inches deep x 18 1/2 inches high. The price is £1650.